It’s so cold in Kansas today! I woke up and the radio said it was 5 degrees F outside. I had the hardest time getting out of bed. We turn the heater way down at night and pile on the blankets to save energy (and money) so the house is super cold in the mornings. I was lazy and didn’t write a post last night so I’m going to dash this off before I head out for work. I wanted to share today a recipe for a simple and inexpensive side dish. 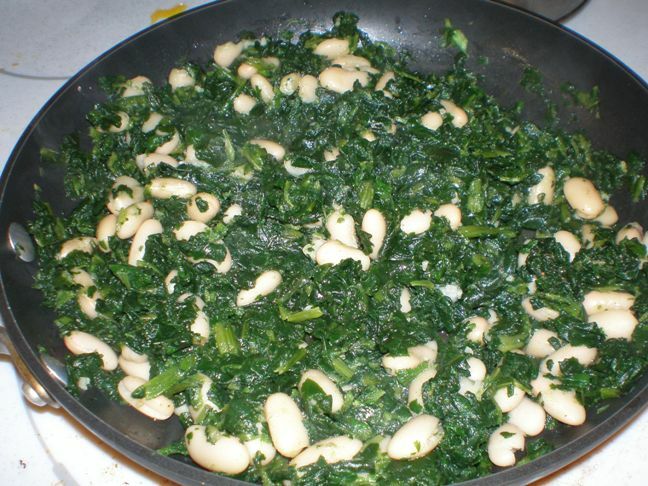 Spinach and white beans, aka Popeye and Protein, aka PNP. This recipe originates from Rachel Ray’s Express Lane Meals. It’s actually part of another recipe, Cheese and Pepper Pasta and Spinach with White Beans, on page 30. But I make the spinach and white beans by itself all the time. Heat a large skillet over medium heat. Add olive oil and garlic. Cook garlic for 1 minute, then add the beans. Cook for 1 minute. Add the spinach to the pan, breaking it up as you drop it into the pan. Season the spinach and beans with nutmeg, salt and pepper. Stir and cook until warm. If spinach was still a little frozen when you started, that’s okay. Just pop a lid on the skillet and cook a little longer until it is cooked through. This dish is so simple and so healthy. The spinach packs a ton of Vitamin A, as well as calcium, iron, fiber and protein. The beans give you even more fiber and protein. Another reason I love this dish is because you can have the ingredients on hand to whip it up at any time. All you need is frozen spinach, a can of beans and some garlic and spices. And finally this recipe is cheap! At Whole Foods I bought a can of cannellini beans for $0.99 and a bag of frozen organic spinach for $2.39. That’s $3.38 total before tax (I’m considering the cost of the garlic, olive oil and spices to be immaterial). Divide the total by 4 servings and you have a cost of $0.85 per serving! Can’t beat that. 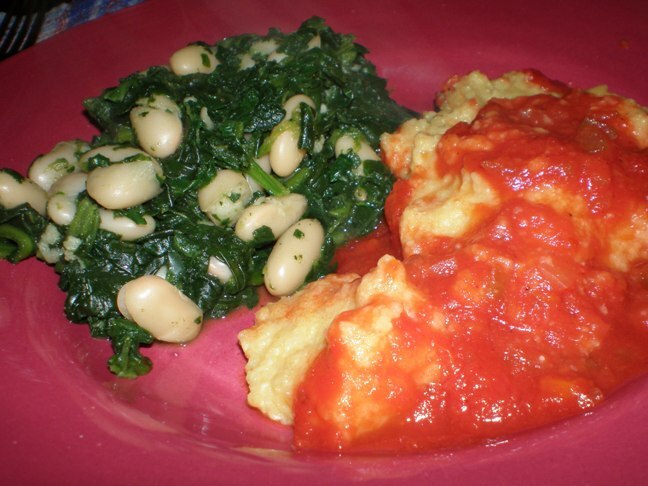 I served this dish alongside Easy Baked Polenta but you could serve it with anything. What are your favorite side dishes that are simple and inexpensive?